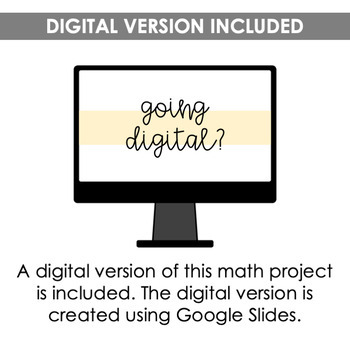 Are you looking for a way to reinforce math concepts in an engaging way that helps your students make connections? 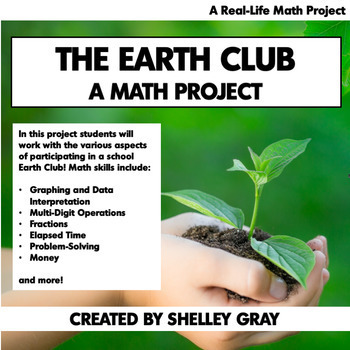 “The Earth Club” is a real-life math project where students will complete eleven different math-related tasks. These activities can be used as a package, or in isolation. 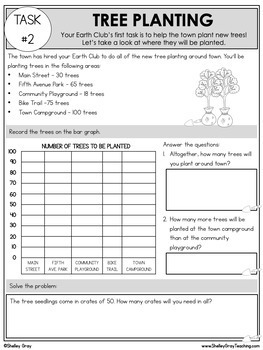 They work great as a math center, small-group lesson, early finisher activity, or partner activity. This particular project is great for the month surrounding Earth Day. Now that you’re part of the Earth Club, it’s important to learn some interesting facts about our Earth! Your Earth Club’s first task is to help the town plant new trees! Let’s take a look at where they will be planted. Your second project is to build a butterfly garden! It will be an amazing habitat to attract butterflies. 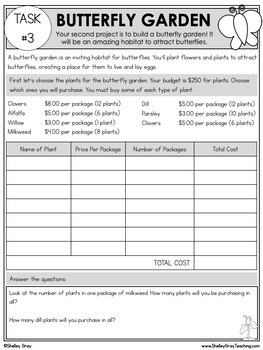 Let’s figure out the total cost of the plants and accessories that we’ll put in the butterfly garden. You want to encourage everyone to recycle, so you’ve decided to hold a recycling challenge at your school! Let’s take a look at the line plot to see how many recylceable items are being thrown away. Your Earth Club is going to the local recycling depot today to help sort recyclables! Use the pictures to complete the tally chart and then multiply to find the total number of items. Your club has started a transportation challenge for the entire school! You’re trying to encourage more people to walk or bike to school instead of driving. This month you’re collecting as many plastic grocery bags as you can. They will be reused at your school. Your next task is to start a school compost! You’ll be encouraging all of the students and teachers to compost whatever they can from their lunch waste! Your school has an after-school Art Club. The club is asking for re-usable materials for an upcoming project! Great news! Your Earth Club has been asked to plant this year’s community garden! This is a huge project for your entire community! Plastic water bottles are not only expensive, but they also create a lot of waste! Let’s learn some facts about water bottles.